These glowing green and bluish-green examples of bioluminescence make a fascinating addition to microbiology studies. Cultures include: Azotobacter vinelandii and Vibrio fischeri. 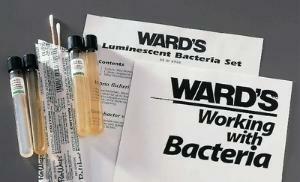 The set comes with photobacteria medium, instructions and the Working with Bacteria manual. Caution: These organisms are non-pathogenic, but Ward's recommends that you utilize proper aseptic technique when handling all microorganisms.